Indigo Dreaming: Is there light at the end of this tunnel? Oh Chez! I am so happy that SOMETHING is now happening! Not knowing is the absolute worst! My hopes and prayers are coming your way. Getting up to your blog today, and reading all of what is happening is partly wonderful now knowing some of this is carpel tunnel...but now waiting once again for test results to see if it is a recurrence of the breast cancer or a problem in the neck. I will pray it is anything but cancer...I feel the Kookaburra's visit and it's meaning was a good sign and that his message was one of total healing for you. Whatever more they find Cheryl...together we can walk this with you and come out the other side into the beauty of the life you are meant to live! We can do this...We will do this...God will light the way and we will follow. Hi Cheryl, I wish i thought of Carpel tunnel as i went thru that in my 20's from work related and loss alot of sleep and pain, i had surgery and made it 90% better till this day but i have weakness in my right hand. So glad u have answer but another long wait for appt. hope they call u sooner and pray it is not cancer.. We are here to be with u, so much love to give u. always in my prayers. 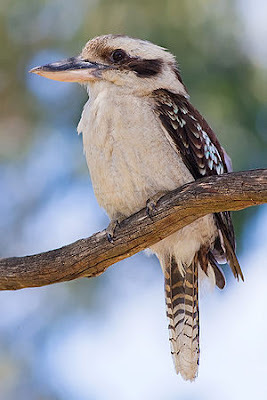 I just Googled the Kookaburra bird and watched it on You Tube. They are interesting birds. How wonderful you found personal healing via the bird. Nature is so so wonderful. All the best on May 6th and 7th, hoping for the best. Lisa you are so sweet! Thank you for your much appreciated offer. I am so sure there will be times that I will want to take you up on it. See from your own pages that you too have suffered debilitating pain. Darling Diane..have been up just 2 hours and here I am thinking of going back to bed. I guess the exhaustion probably comes from the relief of knowing that, at last, something is happening. Audrey was right when she commented on the uncertainty. Something is happening and I feel as if I am in good hands. Thankfully, there was no criticism of my decision not to investigate the lumps as I was bogged down in my grief. I continue to pray to be led to the people that can help me and to be given the gift of discernment. Sweet Karen, I knew that I had a problem however, I had no idea that the damage was as severe as the tests indicated. I have an appointment for Wednesday to see a therapist that can do amazing work without the need for surgery. I think that is a secondary problem for me at the moment. So you know exactly what it is like! Glad to hear that you had huge success with surgery. My doctor did say he felt it would be a process of elimination. Daria, I am so pleased that you took the time to Google the Kookaburra. Since retiring last year, and moving to the farm, I have become so much more interested in nature and the significance of each and every part of it in relation to every day life. I am endeavouring to re-educate the green tree frogs as I continually find them indoors. I know what I would be like if I had one jump on my face, in the dark, during the night. Well Chez, the kookaburra is absolutely right, you know that all your messages and symbols are pointing to the same thing. But of course your hope and your mood levels fluctuate, I am sure you experience several ups and downs each day, am I right? I and all your true friends will be there to help you each time you have a low to raise yourself up again, just like the dignified and gracious soul you are. just came from my last post and now read yours... so you know what the pain is from, Allan's sister has just had surgery on her ELBOW, she too had hand related pain, she had it in the right but her breast cancer was in the left, she had to wait nearlly 2 years, but it has reached the public this last week the condition of the public hospitals here... God Bless and watch over you. I thought this was quite interesting! Glad to hear from you again. I was worried that you were deteriorating. It looks like the doctors might be getting closer to a diagnosis and hopefully will be able to treat you successfully. I hope it is not the cancer returning. Hopefully Mr Kookaburra will keep you safe. Thinking of you in your dark moments of pain. The kiookaburra message is food for thought. I am finding it so hard to keep my eyes open again tonight that I can only think it must be the increased dosage of the meds. My friend Norma has suggested that there is something else and she will get the name of the medication that is a safer alternative to Oxycontin. So excited about the cards my dear friend. Haydn jokingly suggested you will struggle to keep up with me. We are off to Maitland markets tomorrow morning looking for more plants. Hope your weekend is progressing as planned. Have already reached the Safety Net level! I now ask if they will Bulk Bill as I am an oncology patient. Some of the imaging places are kind enough to do that for me. Our health care system is a mess. A 2 year wait is dreadful for someone in pain. Poor Mandy experiences that with Matt. Diane, my dear friend I am delighted to find you sharing the indigenous animal symbolism with me. I am loving it since coming to the farm! Believe it is a path for healing for me also. Feel like I have been away far too long. Miss the blogging and the friendship so much. It is amazing for me to see how much strength I gain from being here. It is a little difficult to catch up with you all when I am absent for a period. I did ask the question if it could just be the carpal tunnel and the doctor said that it would not account for the pain in the forearm. Unfortunately, it seems there has to be more. I have developed three lumps in the region that my breast was removed and it does appear that it could be coming from that area. At best it could be some sort of lymphatic blockage. At worst. Who knows? I do feel that I now have the strength to deal with whatever is given to me whereas for the past two years I would have thrown in the towel. I am so grateful for the friendship I have found on these pages. Confident I will get through this. Kaz, thank you precious lady. I feel the love and know just how impoortant it has been to me on this journey. I simply could not do it without the love and support that comes ever so strongly to me. You have no idea how often I think of a plane ride to Maine knowing how well I would be cared for. I am finding my blogging friends are simply amazing with offers of help and assistance.